Sri Advaita Acharya, the effective cause for the appearance of Sri Chaitanya Mahaprabhu in our world, had two consorts; one was named Sri, the other Sita. Sri Sita Thakurani was the daughter of Sri Nrishinga Bhaduri. She was married to Sri Advaita Acharya in Phuliya Nagar. After their wedding, Advaita Acharya went to Nadia to live in Shantipura. He was an intimate friend of Sri Chaitanya’s father Sri Jagannatha Mishra and naturally, Sita Thakura and Saci Mata were like sisters. On the eve of his son's advent Sri Jagannatha Mishra, seeing the imminent signs of his child's arrival, sent word to Advaita Acharya in Shantipura. Hearing news of the advent of this unprecedented child, Advaita Acharya was ecstatic. With Sri Haridasa Thakur, he went to bathe in the Ganga, and after a long session of kirtan and dancing, he sent his wife to go quickly to Mayapura in Navadwip. The Caitanya-Charitamrita gives the following account of Sita Thakurani's visit to the house of Jagannatha Mishra after the birth of the Lord: "One day, shortly after Sri Chaitanya Mahaprabhu was born, Advaita Acharya's wife, Sitadevi, went to see that divine child with all kinds of gifts and presents. She brought different kinds of golden ornaments, including bangles for the hand, armlets, necklaces and anklets. 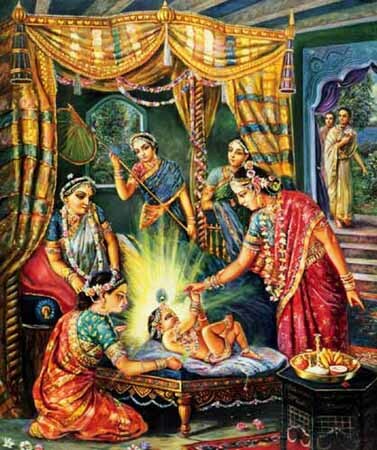 When Sita Thakurani came to the house of Sacidevi, bringing with her many kinds of eatables, dresses, and other gifts, she was amazed to see the newly born child, and she could surmise that the child was directly Krishna of Gokula Himself. She blessed the newly born child by placing fresh grass and paddy on His head saying, "May You be blessed with a long span of life." Being aware of Saci Mata’s previous tragic history of miscarriages, she gave the child the name Nimai (one who was born under a Neem tree). On the day that the mother and son took the cleansing bath and left the maternity room, Sita Thakurani gave them all kinds of ornaments and garments and then also honoured Jagannatha Mishra. From that day on, Sita Thakurani would often come to Mayapura from Shantipura, in order to assist Saci Mata in caring for the new baby. She would give her many different instructions on how to raise children. And after helping with the child in this way, she would return to Shantipura. When it came time for the child's birthday ceremony, Jagannatha Mishra and Sacidevi let the worshipable Sita Thakurani be the first to offer the child his new clothes. Advaita Acharya Prabhu also had a house in Navadwipa. He would live from time to time and discuss spiritual topics with the devotees headed by Srivasa Pandit and Sri Vishvarupa, Nimai’s older brother, relishing hari katha until the early hours of dawn. 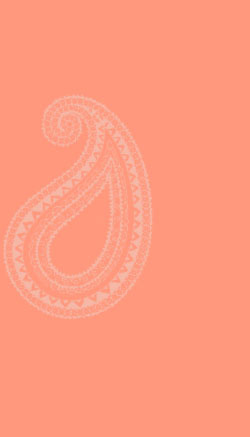 Sita Thakurani and Sacidevi were of one mind; the baby Nimai was their life and soul. Every day Sita Thakurani would go to the house of Saci Mata and help her with the care and nurturing of the boy. After several years, when Jagannatha Mishra's son Vishvarupa suddenly took sanyasa and left home, Advaita Acharya and Sita Thakurani consoled Jagannatha Mishra and Saci Mata and Sita Thakurani helped take care of Nimai, who was just a young boy then, and was also greatly affected by the departure of his brother and the heart-broken condition of his parents. Later on, when Nimai went to Gaya and met his Guru Sri Ishwar Puri and upon returning, gradually revealed his real mission by gathering all the devotees at Srivasa Angan for kirtan, at that time, Advaita Acharya and Sita Thakurani would come from Shantipura to Mayapura, and would be among the first to worship the lotus feet of Sri Chaitanya. Eventually, when Mahaprabhu also took sanyasa and left home, Sita Thakurani spent four days with a disconsolate Sacidevi and Vishnupriya, plunged in a sea of sorrow. Sri Chaitanya Mahaprabhu, after accepting sanyas started off for Vrindavan, but was unable to go there. He was drawn to return to Shantipura. When he arrived in Shantipura, Advaita Acharya and Sita Thakurani felt as if their life has returned. After having fasted for four days, Sri Gaurasundara accepted prasad cooked by Sita Thakurani. Before taking sanyasa also, Sri Chaitanya Mahaprabhu along with Nityananda Prabhu would, from time to time go to the house of Advaita Acharya in Shantipura, where they would have a festival and perform naam sankirtan all day and night. After Mahaprabhu took sanyasa and went to live in Jagannatha Puri, Sri Advaita Acharya and Sita Thakurani used to visit him each year, bringing their son Achyutananda with them. On one such occasion, Sita Thakurani prepared some of the Lord's favorite preparations for him and invited Him to their home to take lunch. Simply to increase their ecstasy, the Lord, who was always absorbed in Krishna Nama, honoured their invitation and took lunch in the home of Advaita and Sita. Sita Thakurani was always overwhelmed with vatsalya-prema and treated Sri Chaitanya as affectionately as if he were her own son. The Lord also treated her with the same kind of regard and affection that he had for Saci Mata. Sri Sita Thakurani bore three sons, Achyutananda, Krishna Mishra and Gopala Mishra, who were all followers of Sri Chaitanya Mahaprabhu. Thus, she was an inspiration for spreading the mission of the sankirtana movement. According to the Prema-vilasa of Nityananda Das, Sita Thakurani had a woman disciple called Jangali. Nityananda-vamsa-vistara relates an account in which Virabhadra Prabhu, the son of Nityananda and Vasudha, once saught shelter of Sita Thakurani, desiring to become her disciple, but she sent him back home to take shelter of Jahnava Thakurani, his step-mother, the other wife of Prabhu Nityananda. Along with Saci Mata, Vishnupriya devi and Malini Thakurani, Sri Sita Thakurani forms the quartet of leading women Vaishnava devotees of Sri Gauranga who supported and gave impetus to the mission of Mahaprabhu during his lifetime. Sri Sita Thakurani ki Jai !